Fight for the Future received a cease and desist order from Comcast’s attorneys for our site Comcastroturf.com. Without net neutrality rules, Comcast could have censored the site outright. Digital rights group Fight for the Future has received a cease and desist order from Comcast’s lawyers, claiming that Comcastroturf.com - a pro-net neutrality site encouraging Internet users to investigate an astroturfing campaign likely funded by the cable lobby - violates Comcast’s “valuable intellectual property.” The letter threatens legal action if the domain is not transferred to Comcast’s control. The legal notice can be viewed here. It claims that Comcastroturf.com violates the Anticybersquatting Consumer Protection Act and infringes on Comcast’s trademarks. Of course, these claims are legally baseless, since the site is clearly a form of First Amendment protected political speech and makes no attempt to impersonate Comcast. Comcastroturf.com encourages Internet users to search the Federal Communication Commission (FCC)’s docket to check if a fake comment was submitted using their name and address to attack Title II based net neutrality protections. 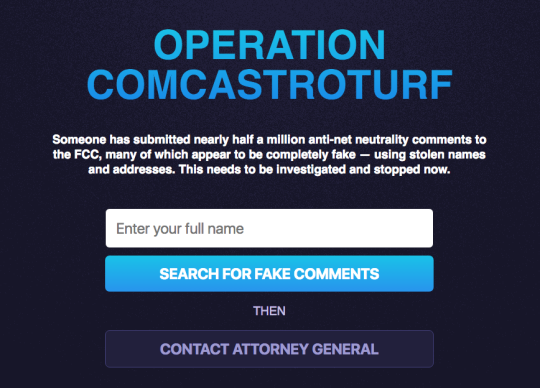 It has been widely reported that more than 450,000 of these comments have been submitted to the FCC – and as a result of the site at Comcastroturf.com, Fight for the Future has heard from dozens of people who say that anti-net neutrality comments were submitted using their personal information without their permission. We have connected individuals with Attorneys Generals and have called for the FCC act immediately to investigate this potential fraud. Fight for the Future has no intention of taking down Comcastroturf.com, and would be happy to discuss the matter with Comcast in court.